President Donald Trump has approved a major disaster declaration for six northern Wisconsin counties affected by flash flooding in June. Wisconsin Gov. Scott Walker announced Friday that the federal declaration covers Ashland, Bayfield, Burnett, Clark, Douglas, and Iron counties. Heavy rains and storms damaged many roads and highways in the area as they sent creeks and rivers out of their banks on June 16 and 17. "This federal disaster declaration will help with the unexpected costs incurred by the devastating floods and severe storms," Walker said in a written statement on Friday, "and it will help us move forward with the recovery process." The federal declaration is for the Public Assistance Program, which provides 75 percent reimbursement for eligible public and private not-for-profit projects including repairs to roads and bridges, and costs for debris removal. State and local agencies cover the remaining 25 percent. The funding will help reimburse part of the $13.1 million in damage to public infrastructure caused by the June flooding in Wisconsin. Minnesota Gov. Mark Dayton also submitted a letter to President Trump on Wednesday requesting a separate presidential disaster declaration for the state in the wake of summer storms. 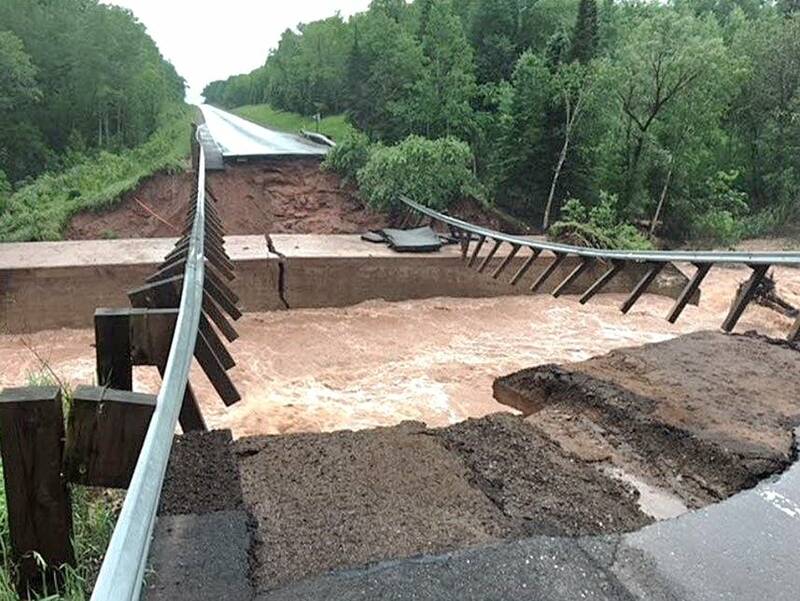 The letter calls for federal assistance to help cover reimbursement for damage expenses in 29 Minnesota counties and three Tribal Nations that had severe storms and flooding between mid-June and mid-July this year. The Nemadji River, for example, which flows from Carlton County in Minnesota to Superior in Douglas County, Wis., reached its highest level on record on June 17, rising from a stage of 8.45 feet to about 30 feet within 17 hours. Storms also caused major flooding in southwestern Minnesota and in the Mora area. "Parts of the state received as much as 400 percent of normal rainfall during that period," Dayton wrote in the Aug. 8 letter. "Nationally, meteorologists referred to the hot, humid, high-pressure ridge that kept this pattern in place over Minnesota for nearly a month as a 'ring of fire.'" Damage to infrastructure in Minnesota from the storms is estimated at about $21 million, according to state officials. Minnesota's disaster declaration request is pending.